On our recent trip to the Pryor Mountains Linda Hanick and I stopped at the Pryor Mustang Center to say hi to our friends, Linda and John Nickle. Linda Nickle told us that a man had called the Center from southern Montana. He told her he was going to take his 12 year-old Pryor mustang stallion to the Billings kill buyer auction unless he could find someone to take him. “Oh no, not again.” I thought to myself as she recounted her conversation with the Pryor mustang’s adopter. I knew the horse whose life was in jeopardy, and I was willing to do anything to get him safely out of harms way. He was born wild on the Pryor Mountains in 2005, a dark colt who roaned out to look like his blue roan father Diamond, the brother of Cloud. The colt’s BLM name was “Free Spirit,“ and he is the same age as Cloud and Velvet’s daughter, Firestorm, and Starman and Rosarita’s daughter, Feldspar. The light and airy colt was similar in conformation to his elegant mother, Polaris. Linda N. gave me the man’s number and I spoke with this very cavalier “gentleman.” It was all I could do to contain my disgust and convince him to let us take the horse at no cost. He told me he could get $900 for him at the auction. I responded that we would pick the horse up but we would not pay him. Would my bluff work? There was a pause on the other end of the line. “OK,” he said and I let out a silent sigh of relief. Two days later, our friend and volunteer Effie Orser, had the horse named “Storm“ on her trailer bound for her home near Emigrant, Montana. Effie told me of her unpleasant encounter with the man who told her the stallion was worth $1,200 at the auction. Effie quickly set him straight. “He is worthless--an untrained 12 year-old wild stallion that the auction house wouldn’t even want.” This sad truth was about to change. 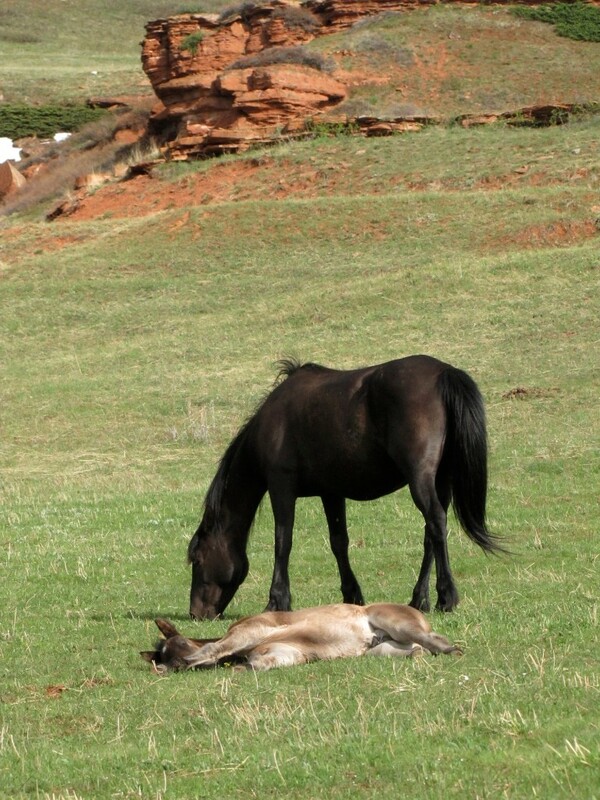 Purchased as a yearling in a Pryor internet adoption in 2006, he had never been halter trained or gelded and, by the looks of him, Effie believes he had been shorted on food as well. Despite his neglect, in only his first lesson, Effie quietly put a halter on him! Bravo Effie! The plan is to geld him soon and then to continue his training. Once he is solid on his groundwork, we will offer him for adoption. Like every horse we have placed, we will be very careful that beautiful Storm has an adopter with the qualifications and commitment of our previous adopters. Only a few days before we learned of Storm I had a chance to visit Long Stockings and his wonderful new adopter, Lori Gonacha. As you can see he is totally stressed out! I first met this flashy colt when I was hiking in the forest above the snow-fed waterhole in the Pryor Mountains. It was June of 2011. I heard sticks breaking and stood perfectly still as the tiny foal tottered by with his mother, Jacinta. They passed through the dense trees and into a clearing. I watched the stocky but slightly unsteady colt nurse. Like his grandfather, Flash, the colt sported tall white stockings and I named him Long Stockings. When I saw him a few weeks later he was trotting confidently alongside his mother. In 2012, Long Stockings was removed as a yearling and adopted, but he was not a good match for his adopters and eventually needed a new home. The gelding first came to our wonderful vet, Dr. Lisa, who suggested trainer Autumn Haney to work with the standoffish gelding. Autumn took Long Stockings to her training facility, Eden's Aspens Horsemanship near Longmont, Colorado. She slowly turned the shy horse around, building his trust and confidence. That’s when Long Stockings met Lori Gonacha, a certified equine sports massage therapist, who works with Autumn. I think it was love at first sight. She adopted Long Stockings in December. Seeing them together the other day, it is hard to believe that the frightened and unfriendly horse is the same one who let Lori approach as he napped. She stooped down and petted him. The trust between these two is wonderful to behold. Lori calls him “Socks” for short. I like it! In the pasture with Socks are a dozen other horses including Diego, adopted from TCF by Eric and Amy Seelig of Erie, CO several years ago. Diego is a very tall (over 16 hands!) offspring of our Freedom Family horses, Conquistador and Cavalitta. His brothers, Grijalva and Hernando, are band stallions on the Pryor Mountains. Diego was removed and spent his early years under the nurturing care and training of Effie and then came to Jaime Wade’s ranch for further training. 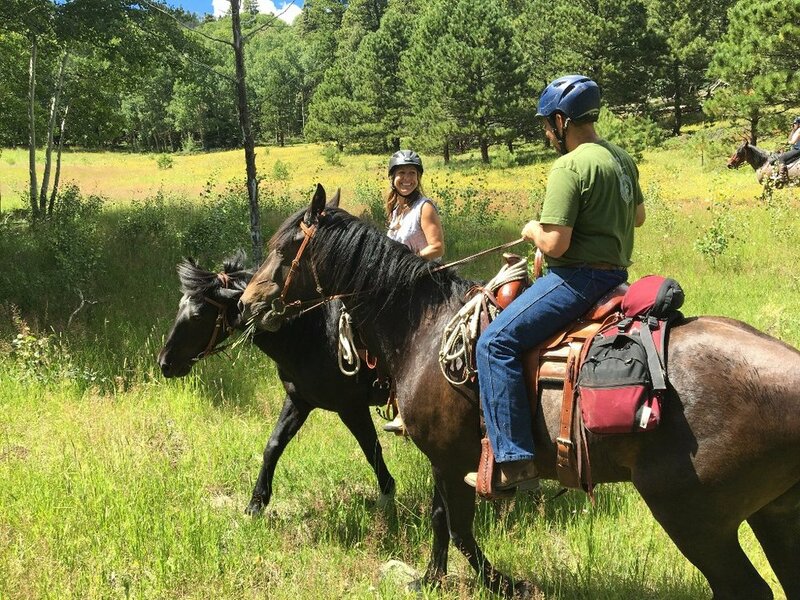 That’s when Eric and Amy Seelig fell in love with this tall, young horse and adopted him. It was Eric who asked Autumn to teach Diego that having Eric as a rider could be a very fun thing. We saw first-hand what a reliable fellow giant Diego had become as he rode along with us in the Sangre de Cristo Mountains near Goat Creek. It was a hot summer day and Diego enjoyed his after-ride shower. “It takes a village” is certainly an appropriate phrase to describe what it takes to bring adopted mustangs back from the brink in the case of Storm, and, in the case of Socks and Diego, to find those perfect adopters and trainers who ensure them a good life in forever homes. P.S. Consider adopting a mustang who needs a second chance. . . or one amongst the thousands in short term holding looking for a loving and patient forever friend. There are no better partners in my book!